The Lake District’s status as one of the most mouth-watering foodie destinations in the UK has been boosted this week with the addition of an extra Michelin star – bringing Cumbria’s tally to five. Cumbria is now the home of four restaurants which hold the prestigious Michelin star status. Rogan & Co in Cartmel – run by Simon Rogan of the nearby L’Enclume, was awarded a one-star rating which sees it join the exclusive club of Cumbrian restaurants which all share the glowing seal of approval by the team behind the internationally-respected 2019 Michelin Guide. Furthermore, L’Enclume itself continues to boast two stars, having been honoured by the Michelin Guide every year since 2005 when the business was just three years old. Simon’s London restaurant Roganic was also awarded a Michelin star. The Forest Side at Grasmere and Gilpin Hotel & Lake House in Windermere have both retained their one-star status. Michelin star restaurants lure gastronomes from all corners of the globe and are famed for offering the crème de la crème of eating and dining experiences – particularly with international visitors. Meanwhile, in Michelin’s new Bib Gourmand awards, the family-owned Dog & Gun Inn at Skelton was revealed as a winner on Friday September 28. Judges cited its “delicious takes on hearty pub classics which are elevated to new heights” for their decision to award the team a “Bib”, named after Bibendum – the Michelin Man. While Cumbria is one of England’s largest counties it is also one of its least urbanised making its culinary prowess even more significant. To celebrate the outstanding food and drink offering in Cumbria, we will be launching our annual Food and Drink Guide this autumn. Introduced by Hawkshead Relish Director and co-owner, Maria Whitehead, MBE, the guide showcases some of Cumbria’s best restaurants, pubs and local producers. 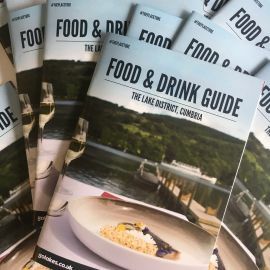 A go-to guide for visitors coming to Cumbria, the Food and Drink Guide is distributed across the county as well as within a two and a half hour driving distance for those planning a visit.